The global B2B eCommerce market, valuing US$10.6 trillion in 2018, is over 5 times that of the B2C market. This reports gives an overview of the market, it’s trends, and the competitive landscape. Currently, Asia Pacific is leading the way with a market share of almost 80%, leaving North America and Europe far behind. Amazon Business and Alibaba are the two most prominent players on the market. Competitive landscape: Amazon, Alibaba, Rakuten, Mercateo, etc. This report gives insights into the B2B eCommerce market, its size, trends, and key players. B2B eCommerce refers to the exchange of goods and services between companies via an electronic platform. 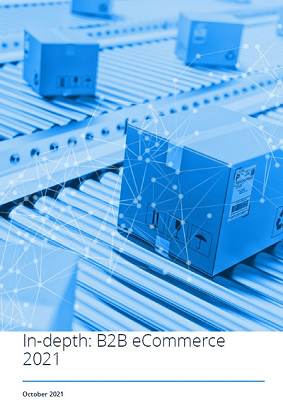 Even though B2C eCommerce has witnessed widespread adoption, it is the recent evolution and growth of B2B eCommerce that is attracting the attention of buyers, sellers and investors all over the world. One of the trends in B2B eCommerce is the rise of vertical or specialized marketplaces. These portals offer a deeper range of products in a particular category along with specialized value-added services. Companies also increasingly use big data to deliver a personalized customer experience. Other trends are the rising popularity of mobile shops, cloud platforms and an omnichannel presence. The lack of quality customer data due to a smaller number of buyers and hyper-specialized services, is hampering personalization efforts. Furthermore, the larger scale and other complexities of the sector such as larger order quantities, variable prices, more products and tighter delivery deadlines are putting a strain on existing supply chains. Another barrier to industry growth is that companies often simply extend their ERP solutions to enable e-business, thus putting a big strain on the legacy platforms. Amazon, Alibaba, Rakuten, Mercateo, Global Sources and IndiaMART are the major players in the global B2B eCommerce market. Amazon rebranded its B2B eCommerce operations from AmazonSupply to Amazon Business in 2015 and achieved sales of over US$1 billion in just a year. Alibaba, which has a share of about 40% in China, is now expanding its operational base to India, Europe and the U.S.